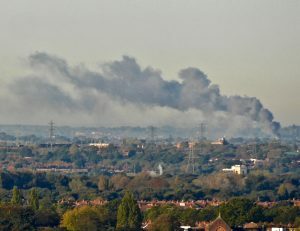 Air pollution is a major concern in many of our cities across the U.K., and indeed through Europe. Indeed, it is thought to be responsible for a significant number of premature / early deaths. The European Environment Agency (EEA) has estimated that air pollution is causing around 467,000 premature deaths in Europe every year. The main culprits are particulates and nitrogen oxides (NOx) - mainly derived from the engines of cars, vans, lorries but also boilers etc. Now research at the University of Madrid has shown that air pollution is affecting bird populations. Dr. Herrera-Duenas and her co-workers collected hundreds of blood samples from sparrows in rural, sub-urban and urban areas. The house sparrow has been strongly associated with human habitation but can live in urban or rural settings. Though they are found in many different habitats and climates, they tend to avoid remote woodlands and grasslands. Sparrows feed mainly on the seeds of grains and weeds, but they are opportunistic and can eat insects and many other foods. The blood samples collected from the sparrows were analysed for measures of oxidative stress . When an animal or bird is stressed by inadequate diet and / or pollution, the number of free radicals (highly reactive molecules) formed in the body increases. As a result the body's defence / immune system weakens. In humans, this can take the form of asthma, cardio-vascular problems or cancer. The Madrid researchers found that urban sparrows exhibited higher levels of free radical damage in comparison to rural birds. 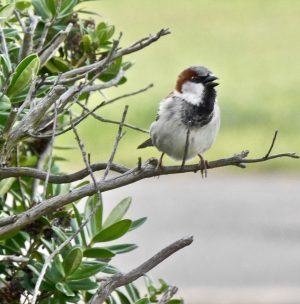 This suggests that the city dwelling sparrows are suffering greater stress than those in the countryside, and this could be linked to the stressors of air pollution (particulates & nitrogen oxides) and poor diet. The problems are exacerbated for the urban birds in the breeding season - they then face the problem of either allocating their bodies resources either their reproductive efforts (egg production, rearing of young etc) or to fighting the effects of pollution; neither of which are helped by poor diet. So not only are many cities problematic in terms of our health but also to those animals (and plants) who share this space with us. Sadly, our polluting ways not only affect us but the wider world around us. Mosses – indicators of nitrogen pollution. Hedges in towns and cities.